The Carpinelo Kindergarten is one of a number of new educational facilities "mushrooming" in the poor Colombian city of Medellin - a city that suffers inequity, war, drugs, trafficking and ecological instability. Designed by Ctrl G Estudio de Arquitectura, the large early childhood facility is conceived as an organism - the modular form responding to the local topography. A concrete canopy links the various forms, adding unity to the complex structure. The use of a Voronoi diagram-type arrangement gives way to a multitude of inner gardens, classrooms, teachers’ rooms, and open courtyards serving as playgrounds. By multiplying and rotating, spaces undergo both centrifugal and centripetal forces, bound by diagonal blue-steel frame ramps, which act as gently inclined runways that let the children run and explore freely. The project forms part of a wider vision for: an improved transport system, schooling, housing and public spaces, the cleaning up of the rivers and streams, building police and security centres and inaugurating business development centres. The 'kindergarten of gardens' is to sow a seed for change - instilling and strengthening community spirit. Via InDesign and The Architectural Review. The new Friends Center for Children building designed by Patriquin Architects has been occupied now for four months, and the administrators, teachers, parents and children could not be more happy. “We are especially proud of the design features that aid in the education, wellbeing and delight of the children that learn here everyday,” says Center Executive Director Allyx Schiavone. The purpose-built facility is located in New Haven amongst acres of protected forest and wetlands, providing a serene and inspiring backdrop for the children's learning and discovery. A kids drawing of their dream school is made into reality as a "soaring ark"
The 'Rainbow Ark Soaring in the Sky' school designed by Japanese architect Kikuma Watanabe was brought to fruition to alleviate poverty in the Sangkhlaburi Village in Thailand. Due to a desire to a provide a better future for the children, the village teacher asked the children to draw the school of their dreams. One, a flying ship, was then translated into the design. The design is comprised of solid round 'earth bag' volumes on the ground and a floating, light steel and bamboo structure with a grass roof above. The earthbag domes conceived as "launching pads" that supply the ship with the energy of mother earth. The upper structure as a ship that is soaring in the sky. The school has become a successful place for the community to enjoy studying, playing, and praying everyday. The round volumes create a sense of comfort, security and warmth, and are used as a prayer dome, entrance dome and classroom. The upper "soaring" spaces used as a Buddhist room and classroom. When a design for a new sports arena using an old war bunker was deduced insufficient in size, the hunt for a new site began. This led to the idea to integrate the new sports arena with the redesign or of a tired old school and nursery, Ny Krohnborg. Designed by Rambøll Norge + Arkitektgruppen Cubus AS and located centrally in the neighbourhood of Løvstakken, Norway, the fusion of sports and cultural arena with a school and nursery provides a new "hub" for social integration and activity whilst revitalising and giving new energy and optimism to the community. The existing site occupies a tight and inclined space between two streets. In order to fit the new sports hall, stage, musical facilities and cafe, the school yard was excavated and the new facilities inserted below. Enabling the neighbourhood activities to break out onto the street edge. The original school building was a listed historic building. Therefore the new design works to respect the character of the old, whilst infusing it with new life. Natural stone, slate roof tiles, small pane windows, cast iron details and panelled doors are maintained. Subtle changes include allowances for better natural light, increased functionality and new doors and windows between the classrooms. The new structure however, is a stark contrast to the old, expressing lightness, colour and a lively energetic form. The circulation within the school/cultural centre was given serious attention and thought. While the original school provided narrow flights of dark stairs purely for circulation, the new design employs a number of circulation spaces - lifts, ramps and stairs with improved lighting, visual signage and colour coding. The large atrium space serves as a central point not only connecting one space to another, but as a comfortable and lively space to hang out and take in the hub of activity. A major aspect of the design was for the architecture to work seamlessly with the landscape. The school yard located atop the cultural centre cleverly breaks out onto a central landscaped courtyard facing away from the street below. The many ramps, levels, textures and undulating forms cater for a number of play activity - skating, running, cycling, climbing and acrobatics. Ny Krohnborg is an example of how a school and nursery might serve more than just the children. Rather creating a place which welcomes the entire community. The best thing about the internet is connecting with like-minded and inspirational people. 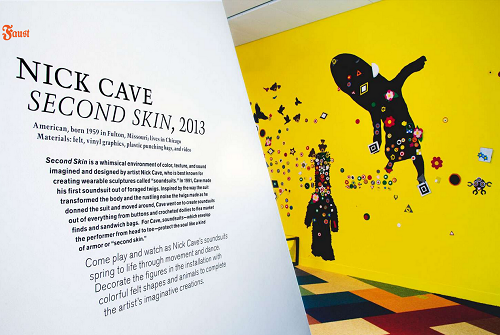 Bree Angela (designer and fabric artist) recently got in touch with me and kindly shared her latest experience in collaborating with artist Nick Cave and Faust Design Studio to create the 'Second Skin' exhibit held at the Denver Art Museum. Bree's experiences as a designer and art educator for young children has led to a passion for creating more transformative spaces for children to explore their creative and imaginative capacities. I admire her passion and her perceptive response below. 1.Where did the inspiration for the idea of an interactive skin come from? 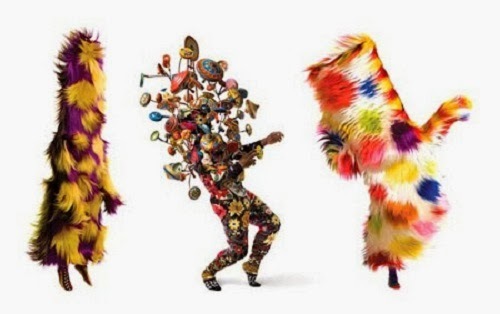 Nick Cave is known for his intricately sculpted Soundsuits. And, as Cave refers to them, they are "armor or second skin," they seem to protect the wearer's identity, gender, race, and class with their bright colors and wild character. One's identity is safe behind the costume giving the wearer the permission to express themselves freely without judgement. They become someone- or something-else. This was the inspiration for the 'Second Skin' interactive exhibit. Participants could decorate, tear down, and re-decorate their own Soundsuits. 2.What did you learn while bringing the idea to fruition? I learned that felt is a fabulous material! Kids really connect to felt and the felt board concept! There is such a familiar and wonderful tactile experience when playing in a natural soft environment. The process of choosing the best way for the children to interact in this space intuitively turned out to be an important learning experience. Keeping the pieces open ended and reversible with no extra attaching elements or particular order allowed for more energy to go in to the creations themselves. Especially, after absorbing the 'Sojourn' exhibit, which was incredibly beautiful and quite ornate! The simplicity of this space, although colorful and filled with unusual forms, allowed children and their families to express what they just experienced without any rules or limitations. It was a blank felt canvas! 3.What do you believe to be the most overlooked aspect in regards to designing for children? I think that there is sometimes too much information, direction, and maybe too much expectation happening in designing for children. By that I mean, there needs to be more open ended design, where imagination creates the space, not vice versa. If you take a look around at some of these designs its like, ok...here is what I want you to do, here is what I want you to learn. Its already layed out in a way where the kids can see A to B. What if there were more spaces that allowed for kids to think out of the box, to explore imagination itself? I think designers should keep that in mind. Allow the children to participate in the design of the space. This encourages leadership, self expression, and endless imagination. 4.How do you think we can raise awareness of the importance of creating imaginative spaces for children in the public realm? Creating an awareness for public imaginative spaces for children is slowly, but surely, starting to unfold. We are in a time in history where we, like the Reggio Emelia folks, can look around and see that in order to change the future for the better we need to put love and energy into the children and the way they learn. I'm hoping that the Education System and the Art Industry can continue to brainstorm and collaborate to really focus on the potential of children's imagination and learning capacities. 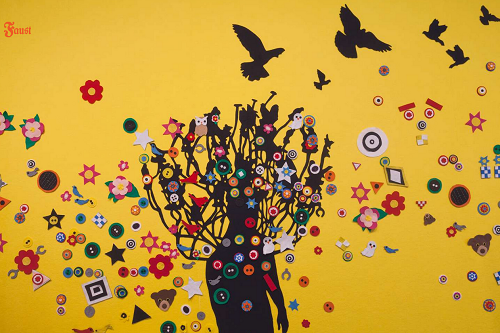 I'm also hoping there is more exposure on artists such as Nick Cave that are community driven and act as a vessel for others, especially children, to explore their creative potentials. The more conversations about people like this will spark awareness, which will spark the movers and the shakers to bring new ideas to the public. The exhibition installation runs until the end of March. For more information, see Denver Art Museum.